It's no secret that we love us some Star Wars at this house, but did you also know that we love sharks too? We live for SHARK WEEK and we can't wait each summer to watch this crazy week long celebration of sharks. 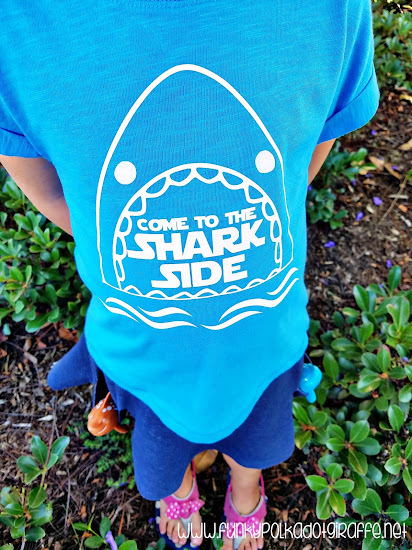 I don't if it's because we live in Southern California and are avid beach goers or if it's because I wanted to be a Marine Biologist when I was a kid, but the love of the ocean and these mysterious creatures is strong with this family! 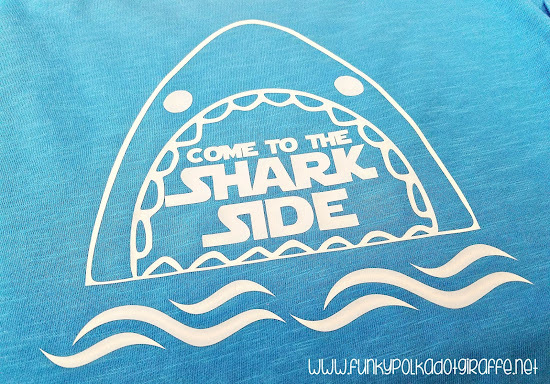 So, this year, I decided to really get into the spirit of SHARK WEEK and create a fun t-shirt design to commemorate the week. I combined our love of Star Wars with our love of SHARK WEEK and the COME TO THE SHARK SIDE t-shirt design was born! I created the design in Photoshop and then saved it as a format that could be used by my Silhouette SD machine. Yes! I still have the Silhouetted SD. Maybe one day I'll get upgraded to the Silhouette Cameo. If you're listening Silhouette America - I am open to sponsorship! Hee, hee! I like to do a cut of the design in paper first to make sure I like how the size and dimensions work on the shirt I'm working with. It helps me to get a visual of the design on the shirt and make sure that the cut design translates well to a vinyl iron-on image. Then, before you cut your vinyl design, make sure that you have flipped it to MIRROR IMAGE or backwards so that the words are facing the right way when you iron it on. You'll load the heat transfer vinyl with the clear plastic backing down. I always use a mat, but with the HTV you don't have to. Set your blade and cut settings to the type of material you are using. You don't want it to cut through the clear plastic backing, because after you weed your design (or remove all the extra vinyl from around the design), you want your design to be stuck to the clear film so you can flip it and iron it onto your shirt. Once it's all cut, it's time to weed! Once all the extra vinyl is weeded (or removed), then you iron it on! TIP: To make sure I get the design centered on the shirt, I fold the shirt in half and iron a crease into the shirt. Follow the directions on the HTV product for how long to iron and such. Then, get to ironing! 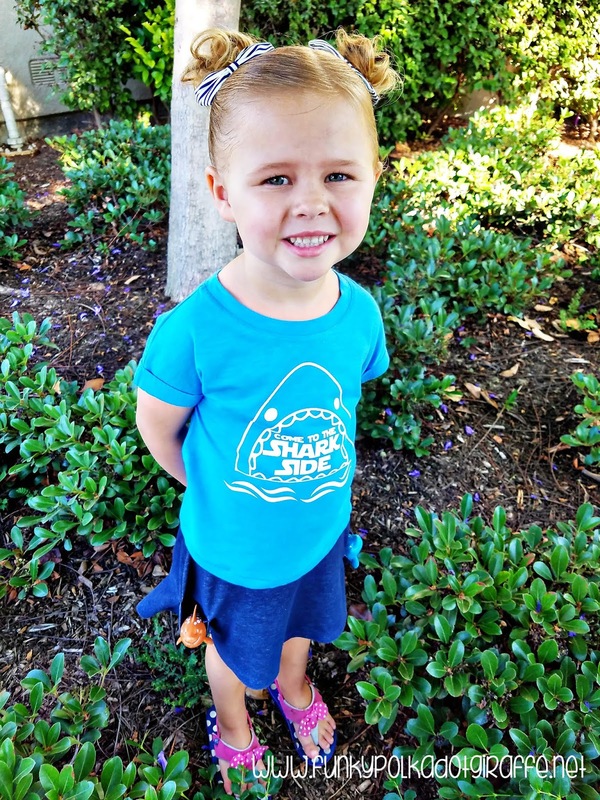 I think this would be super cute on a tote bag, but Grace is loving it as a super cool shark shirt. She insisted on having her diving sharks in the the picture too, so they hitched a ride in her pockets. 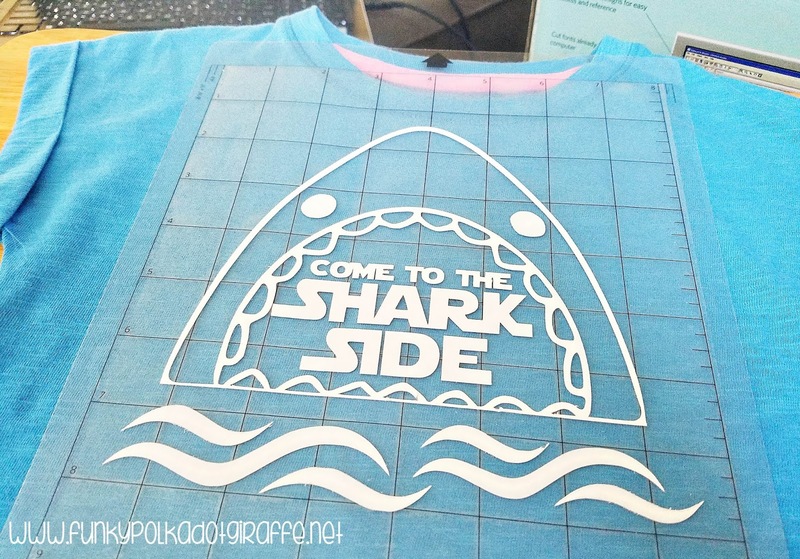 I hope you enjoy SHARK WEEK and this t-shirt design. You can download the Silhouette cut file by clicking here! 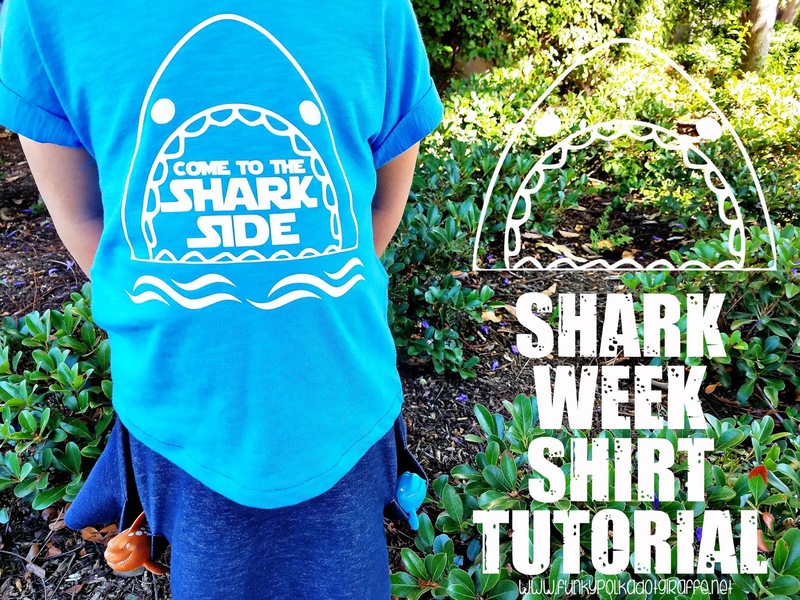 DO YOU LOVE SHARK WEEK? HOW DO YOU CELEBRATE?